When I booked a trip to Prague, I had no expectations for the weekend. Aside from the infamous John Lennon wall, I knew nothing about the city and what it would have in store for me. Friends and blogs highly recommended a trip to this city, so my roommates and I decided to take the advice. Prague’s colorful streets and beautiful architecture displayed on each building is nothing to look past. Every street we turned onto offered a new array of buildings, which made the city one of the more unique places I’ve been to so far. Not only does Prague contain a pleasurable aesthetic, many of these buildings are extremely old and rich in history. A local tour guide named Chris took us on a two-hour expedition around the city. He was extremely knowledgeable about everything to do with Prague, starting from hundreds of years ago up until today’s time. I was able to jot down some key pieces of Prague’s history as well as a few medieval stories I found to be quite interesting. Interesting piece of history: German forces in 1939 surround the Old Town Square – some buildings remain still intact. The tall castle looking building shown in both photos is called the Church of Our Lady before Týn. The famous Astronomical Clock tower is a huge tourist point. Every hour, the tiny doors on either side of the sitting statue open up and apostle figures rotate around inside the tower. The clocks themselves – on top is the astronomical dial and the calendar dial is below. According to Chris (our tour guide), legend says the Prague Councillors loved clock master Hanus’ clocks so much, they didn’t want him to make the clocks for any other city. So, the Councillors burned his eyes until he went blind and cut off his tongue so he couldn’t tell anyone how to build one. He rebelled by jumping to his death, down the clock work. This destroyed the clocks and for decades and for a while, no one was able to fix them. Pinkas Synagogue, a holocaust memorial site. After being closed to the public after Soviet invasion of Prague, the museum was reconstructed and reopened in 1995. The Old Jewish Cemetery sits just behind this building. On the tour, I learned this cemetery was built in twelve different layers since land in Prague was scarce. Because of this, the cemetery is a few meters higher than the streets and is said to hold 12,000 tombstones. Our next stop was a self-guided tour of the Czech Beer Museum. In the exhibit, there were many rooms filled with information on ingredients found in beer and how it’s produced and packaged. Multiple displays of hundreds of beer bottles and caps lined the rooms. In the center of one of these rooms is a table with eight various flavors of beer seeds for tasting. I tried three kinds and most of them tasted awful to me – extremely dry and bitter. After exploring the museum, we headed into the pub area where a man filled beer glasses with the first (out of four) kinds of beer. One of the darker beers had a slight caramel flavor, but I was only able to contently finish the first. Although I’m not much of a beer drinker, I enjoyed this experience and it was fun to sit down with my roommates for an hour or so and relax. The Prague Castle was an amazing sight to see, with free entrance as a bonus. Once past the gate, there is a short walkway that leads into a huge open square. 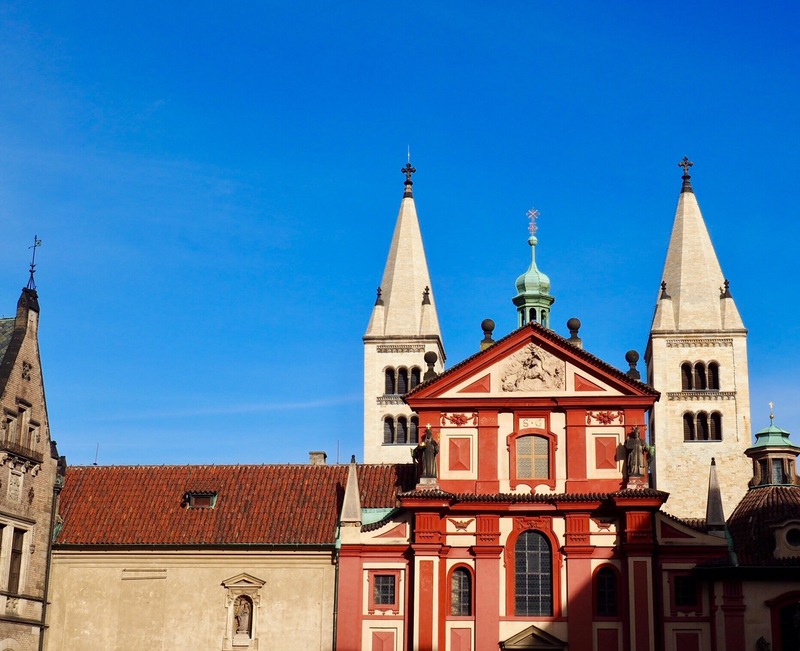 One of the first buildings people can enter is the Church Of Our Lady Before Týn. We were able to view the west end of the church and it was absolutely incredible. Intricate stain glass was built on each panel of the surrounding walls as well as the front and back of the church. One of many entrances to the Prague Castle sits high above the city. This picture is taken right outside the castle, showing a breathtaking view of Prague. Of course one can’t visit Prague without making a trip to the John Lennon memorial wall. The trek to the wall and our experience there was nothing but a tourist trap. Most tourists in Prague flock to the well-known landmarks, which made traveling from place to place quite difficult. 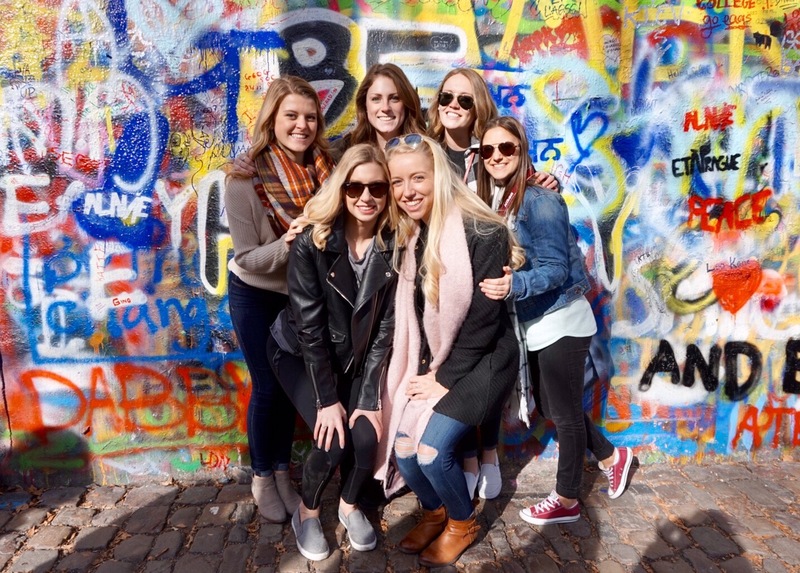 We reached the John Lennon wall and it was filled with inspirational quotes, lyrics, names, and symbols related to Lennon from tourists throughout the years. A local guitarist played Beatles music as tourists came and went, creating a friendly and inviting atmosphere. The entire wall – not as big as I had imagined, but a unique landmark to see in person. Lastly, but surely not least: The Trdelnik. My roommates and I referred to them as “turtlenecks” during the weekend for lack of a better pronunciation. For no more than 120 Kč (koruna – Czech’s currency), these heavenly sweets are a great purchase. 1 Czech koruna = 0.039 USD, which means a trdelnik can go for anywhere between $2.34 – $4.68. 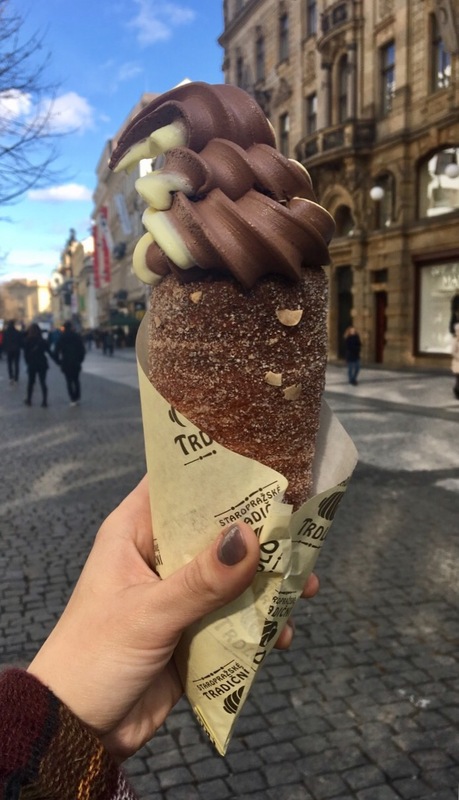 Trdelnik’s are served as a cone with ice cream, whipped cream and strawberries, etc. or a cylinder-shape with cream, Nutella, chocolate, etc. filled on the inside. The dough is wrapped around a stick to be shaped and cooked golden-brown, and is covered in sugar, nuts, and various candy toppings. Finally, the spread or topping is added and it is served warm. A melt in your mouth dessert. The trdelnik in one of many forms. Although I wouldn’t choose ice cream as a filler again, it sure was just as delicious as it looks.